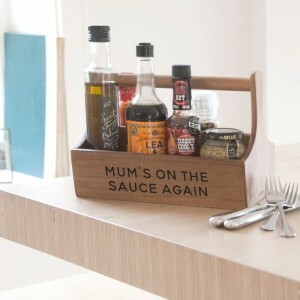 This handled wooden holder is just the thing for all the necessary sauces and condiments that take your evening meal to perfection! Made from solid Acacia wood and expertly laser engraved in our studio on the Isle of Wight with your own choice of wording. It could be a name, your surname or a fun little saying - anything you like! We can fit up to 30 characters over 2 lines. It is super decorative and the perfect size for all his or hers favourite relishes, sauces, mustards and more!